Toyobo has overcome the crisis of deteriorating performance stemming from the global recession, and is seeking to regain growth. Over the past year our earnings capacity has steadily recovered, and now we are shifting our priority to achieving growth. 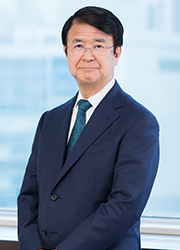 In light of the new business environment, Toyobo recently formulated a new medium-term management plan to be implemented through the fiscal year ending March 2014. The vision is for Toyobo to become “the category leader, continuing to create new value that contributes to society in the environment, healthcare, and high-function product fields.” A “category leader” is a business that overwhelmingly dominates in a specific market or field as a result of a company’s unique technologies and expertise. We will expand our strong businesses both in Japan and abroad, and work to generate the next categoryleading businesses. We anticipate 8% annual growth in our specialty businesses, and will continue to manage the textiles and other businesses with an emphasis on asset efficiency. We expect the specialty business fields to account for 75% of sales by fiscal 2014, establishing a high-earning business portfolio.